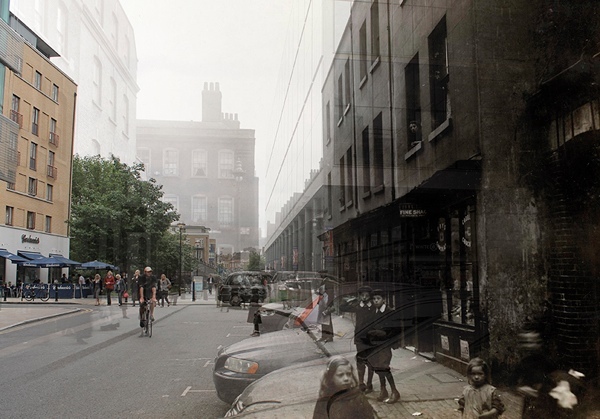 After seeing the work of photographer C.A.Mathew published on Spitalfields Life, Adam Tuck was inspired to revisit the locations of the pictures taken a century ago. 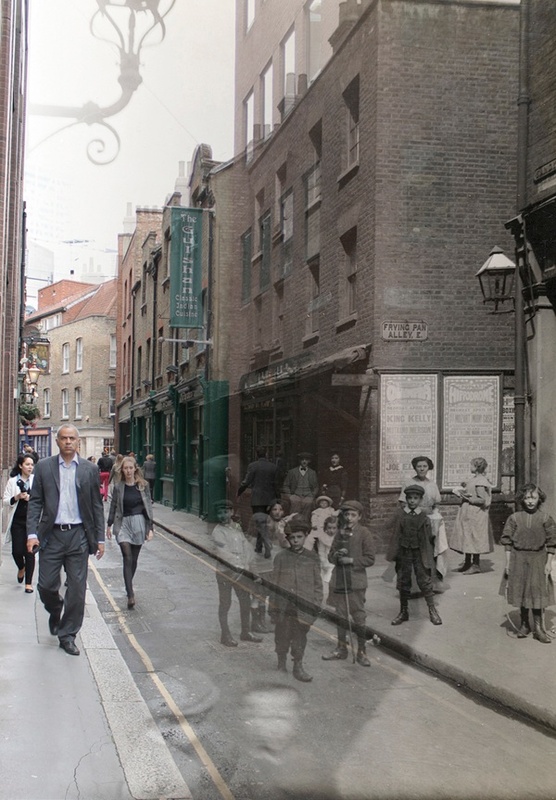 Subtly blending his own photographs of Spitalfields 2012 with C.A.Mathew’s photographs of Spitalfields 1912, Adam has initiated an unlikely collaboration with a photographer of a century ago and created a new series of images of compelling resonance. 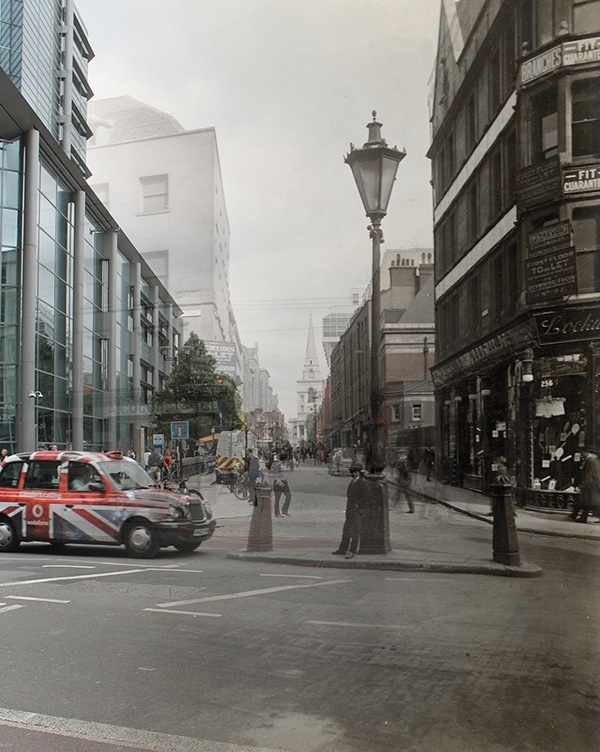 In these montages, people of today co-exist in the same space with people of the past, manifesting a sensation I have always felt in Spitalfields – that all of history is present here. Yet those of a hundred years ago knew they were being photographed and many are pictured looking at the camera, whereas passsersby in the present day are mostly self-absorbed. The effect is of those from the past wondering at a vision of the future, while those of our own day are entirely unaware of this ghostly audience. It is hard to conceive of the meaning of time beyond our own lifespan. But these photographs capture something unseen, something usually hidden from human perception – they are pictures of time passing and each one contains a hundred years. 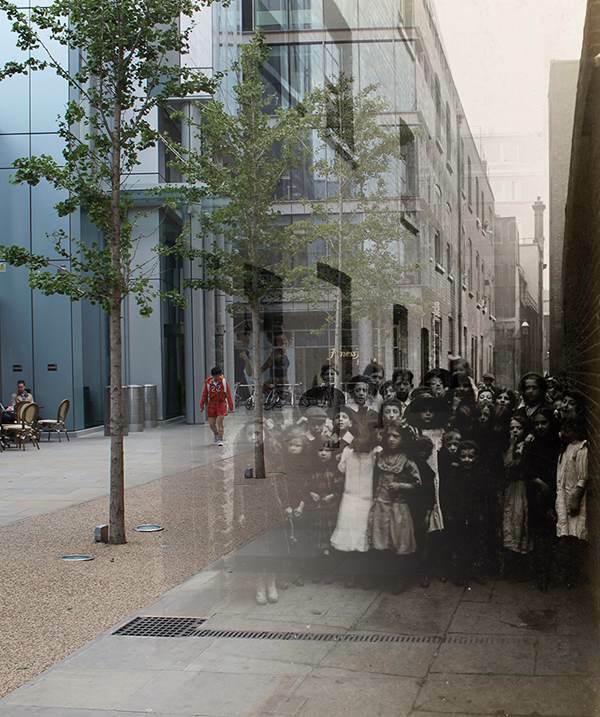 What a fascinating project – all those ghostly little children looking in awe at the flashy fast cars and glass buildings. Beautifully done Adam. 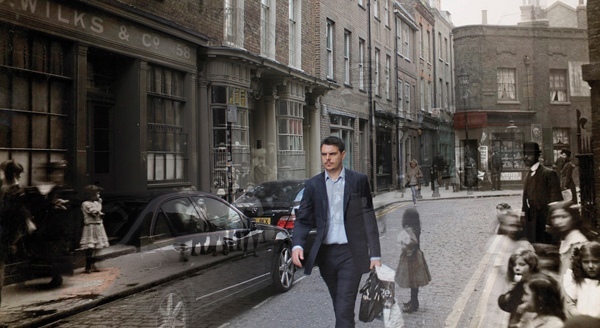 The ‘In Crispin St” composite is particularly striking as the modern man appears to sense a ghostly presence. What a brilliant concept! Magical! 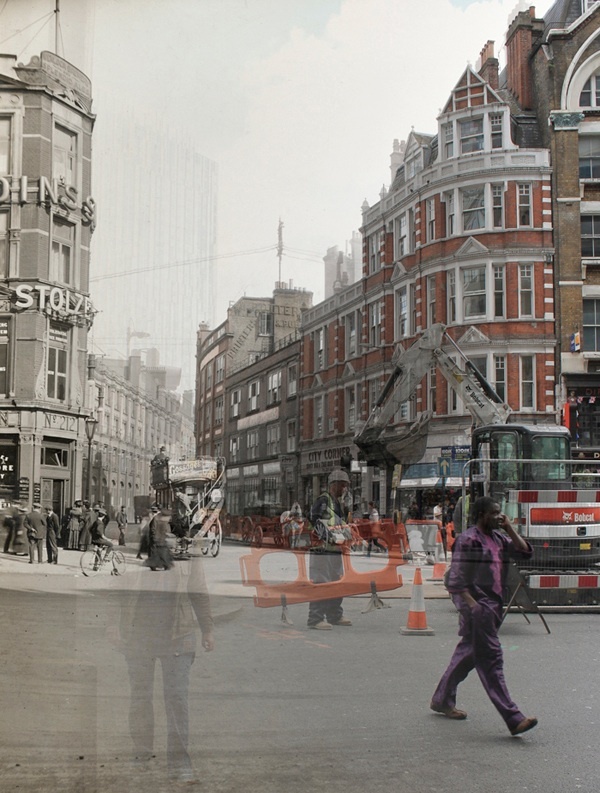 As a family historian who would give anything to possess a “time machine” to go back and visit my ancestors WHEN they lived -at least, through Adam Tucks brilliantly creative and haunting photos, one can visually move back in time.Just wonderful ! Here’s hoping there will be some more on the way ! I just spent a few days in London (for the Pre-Raphaelite exhibition and Spitalfields Antiques Market), and that’s exactly what it feels like. A bit like a time machine on the blink. Unfortunately, I wasn’t able to attend your reading. Hope it was a lovely evening! I hoped someone would do this when I looked at these photos the first time round on your earlier post. The results are so moving. So sad and poignant, but also life-affirming to see the spirits in situ of the souls who came before. The Gentle Author – Well Done!!! Wonderful! Well done. They have a haunting quality, but also a touch of the comic due to the way the modern characters are often looking towards the past in their glances. Spine tingling, haunting photographs. Perfect subject for the Christmas Season. I forwarded the link to this to many of my friends and they are all replying with enormous enthusiasm. ‘Magical’ was my first response and magical it most certainly is. Brilliant photographs but I can’t help being reminded that such a mixing of old and new in the darkroom was how an episode of spooky 70s TV series ‘Sapphire and Steel’ started.No real need to say it didn’t end particularly well for some. Oh my! What amazing photos! I love the way everything stopped for a photographer 100 years ago, even though photography was well established by that time. Everything has to be much more extravagant to grab the attention of the 21st century person today, which is such a shame. I think we’ve lost a lot alng the way. Inspired idea, artistic vision, technical wizardry, words of a poet. Thanks to you both for a great post. Compelling. Thank you Adam Tuck – and C A Mathew. 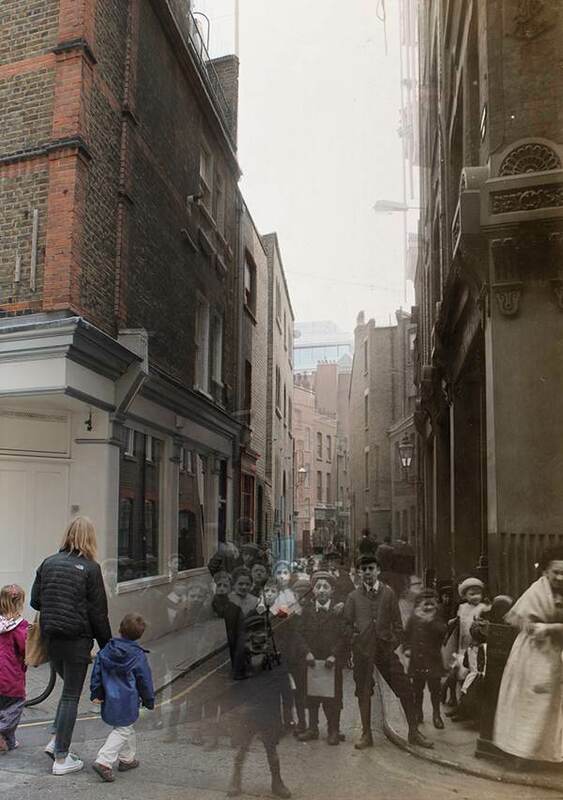 The photos in which a present Spitalfields resident seem to be seeing the ones from the past, or vice versa, are particularly fascinating and haunting. Could there possibly be photo subjects in the same frame as their own kin? 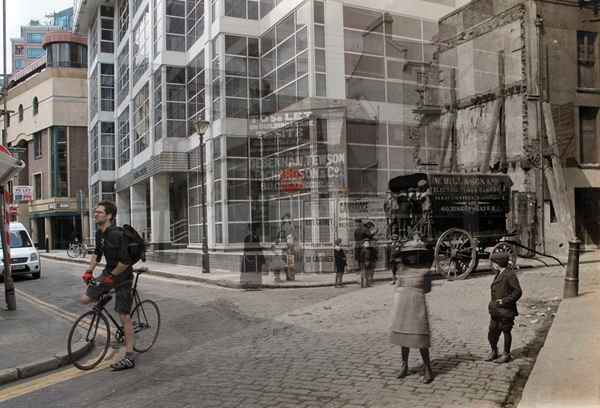 What great photography blending the past with the present. I, now,wonder what another five hundred years will bring to these views. Fantastic. I enjoyed this very much. Great concept. the liveliness of those real faces and bodies occupying space on the street as we do not — is really brought out in these amazing photographs. the ghostly street lamp sconce — those bright-eyed people of yore, making eye contact. you know that doesn’t happen in america. not that we have sidewalks anymore. Thank you for these very compelling photos. I took several minutes with each picture just imagining… Especially the old buildings cpmparedto the new. What a difference. Thank you. Give us more please…. How cool is that! I never get tired of viewing and studying old photos. 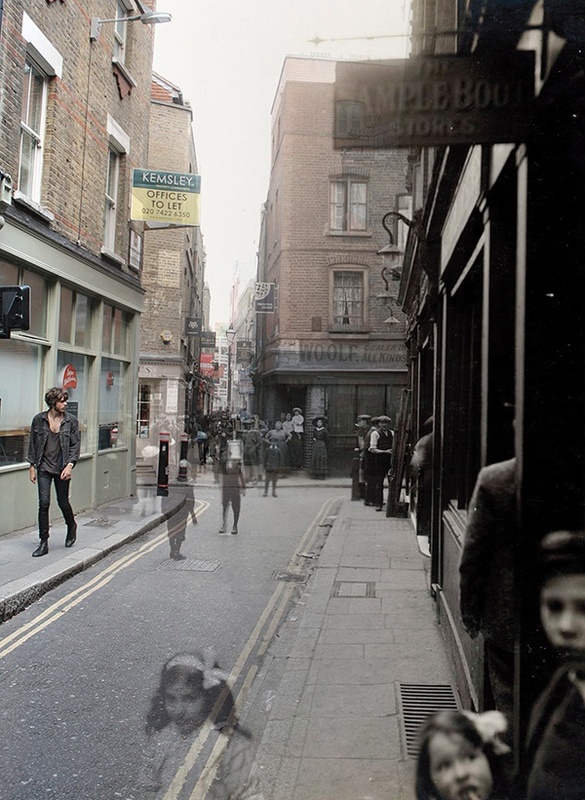 Would you ever consider doing me a print of Artillery Lane? It is a fantastic image! Thank you for showing these amazing photos – what a brilliant original idea. Excellent images and extremely skilful of Adam to take and combine the images in this way which I am sure involved many long hours on his computer. Many thanks for sharing this. It’s been said that lost time is never found again – but Adam’s work proves this wrong. Thank you both for this post. Wonderfully surreal! Well done. I also like the Bethnal Green cafe shots. Ace. These photographs bring to mind all the souls that occupy a place throughout time. How a place is imprinted with so many individuals, all of whom bring their own individuality into the fold. Stunning and inspiring. It would make a compelling subject for an exhibition. How did Adam find the right angle-lens to match those of old? I tried a similar thing with pictures of my village but the lens did not match the old angle. Cracking stuff Adam Tuck, I know this area very well, having worked and entertained there in the 60s at a pub called The Primrose on the corner of Primrose St and Bishopsgate, also in Folgate St. Blimey, mate, this brings some memories back! Ive been a photographer for some 50 yrs or so, now retired, so I can appreciate the toil and troubles you must have had, delicately putting this masterpiece together. I think Mr Mathew would be very happy with this creation, if he were here now ! You are obviously a Master of your trade–Thank You. Just brilliant – the simplest ideas are always the best and the most powerful, although I’m sure there was huge work in bringing the shots together to look effortless. Just wow – these are stories waiting to happen. This is a great work of art – thank you. Amazing photography and a great article! Enchanting and eerie. I love the way that the present day people seem almost aware of the children in the photographs, as if a little bit of history is washing off on them. Absolutely magical. What a fantastic idea, and so perfectly executed! Truly poignant and beautiful. Superb! Thanks for this magnificent discovery. Awesome very atmospheric love the surreal feel to the photographs . 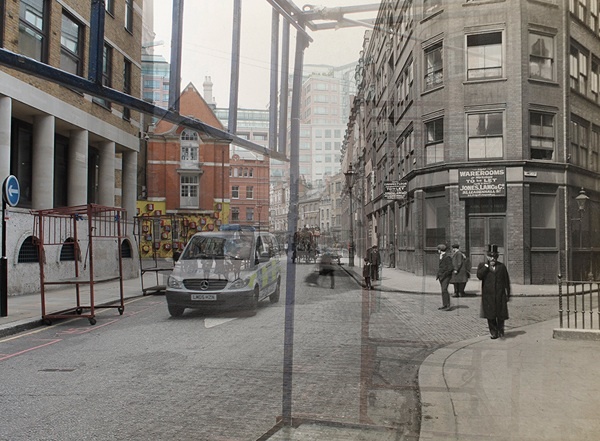 these are quite amazing – how the streets have been taken away from the people…. These are really spooky! But brilliant! What a dramatic compilation. To see history superimposed on contemporary views is remarkable. Well done!! Have you produced a book of these photo’s? Knowing these children have all passed away brought a tear to my eye and the montages themselves gave me goose pimples. Please could you ask Matthew how he matched the modern mechanical or digital camera lenses to the old glass plates as i’d like to do this for Bristol myself. Found your link on Vicki Lane’s blog and just had to check this out. What an awesome project this was. I was absolutely fascinated! Wow!I am studying Quantum Physics and the possibility [probability?] of parallel universes.Although these are superimposed photographs it illustrates what some scientists are saying.Wonderful. Breathtaking. Immense talent matched by a colossal amount of technical ability and work. The sensitivity for the subject takes you there, to both time-frames simultaneously – a sense of vision which can only be admired and envied! Bravo! Can you imagine these printed on those cards where you can turn it to switch between two images! amazing stuff. Absolutely brilliant idea, & so well executed. 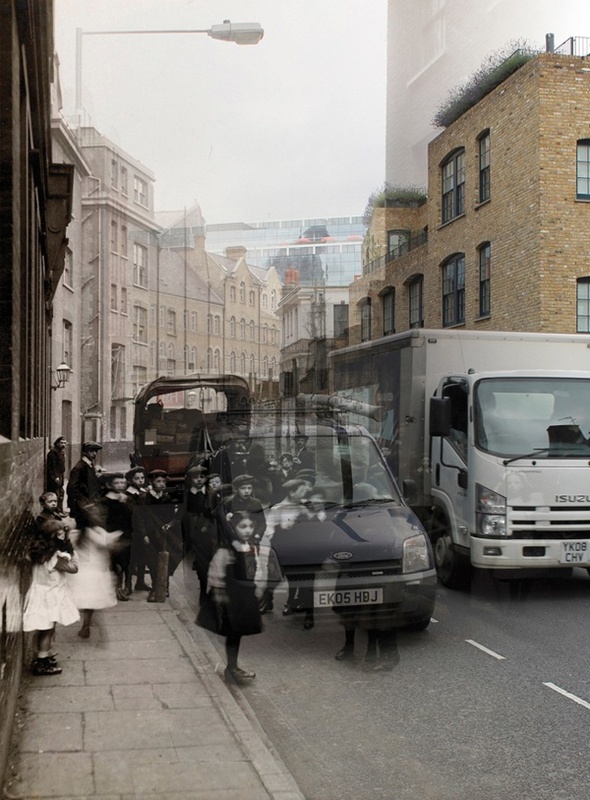 Being born & raised in Petticoat lane in the prewar years as I was, I knew every street here depicted intimately. And as an inveterate Photoshopper, I know the hours that went into this collection. When I get some time I will do a somewhat similar project in my new home town of Westminster, MD USA. Just fascinating, and a bit eerie. As I viewed the photos I wondered which side of the street do you feel most comfortable on? The timeframe of the past felt actually peaceful. Great work of art. What a fantastic idea! The pictures are astounding, profoundly evocating and even spine-chilling. Congratulations on your beautiful work! And thanks for sharing it. These superbly successful composites are still haunting me, months after viewing them. Beautiful work! Do hope to meet you some time, Adam. Wonderful photographs. 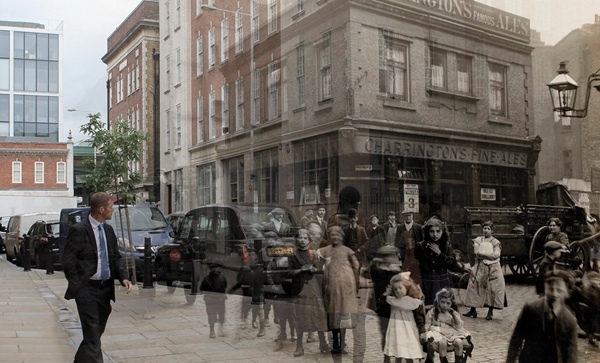 My ancestors arrived in Spitalfields and were silk weavers. These pictures give me some idea of how my grandmother must have lived. She was born in 1900 and with her family was in the workhouse at three years of age and again at the age of 10. At 11 years old she was sent to Dovercourt to learn her trade as a skivvy. Do you have any photographs of the workhouse or more of the localle please?